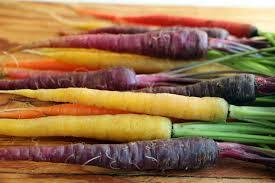 Are farmer’s markets carrots looking a little funky to you lately? Deep purple, dark red, white and bright yellow varieties may have you wondering what got into the fertilizer. Carrots are one of the most basic and familiar of all the vegetables, but researchers have been changing up their colours and nutrient content to introduce entirely new varieties. Although geneticists have been creating these colourful carrots for many years now, they’re just starting to become popular among small-scale farmers, which means they are starting to earn shelf space at your local farmer’s market. You can now enjoy ordering yours all year round.